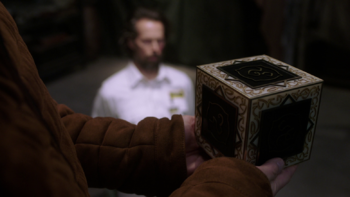 The Enochian puzzle box is a device, adorned in Enochian script, that has the capability to trap a demon. If the puzzle box is opened, either by force or solving it, the demon will be released as a result. It is unknown where Mary got the puzzle box. After being kidnapped by Nick, Mary Winchester admits that she trapped the demon Abraxas in an Enochian puzzle box when she couldn't defeat him in a fight. Nick forces Mary to lead him to her lock-up where she has hidden the puzzle box and Nick tries to open it. After failing to figure out how to open the box, Nick drills into the top and tosses the puzzle box into a devil's trap where he has a meatsuit waiting. Abraxas is released in the form of demon smoke and immediately possesses the man. This page was last edited on 15 February 2019, at 11:00.